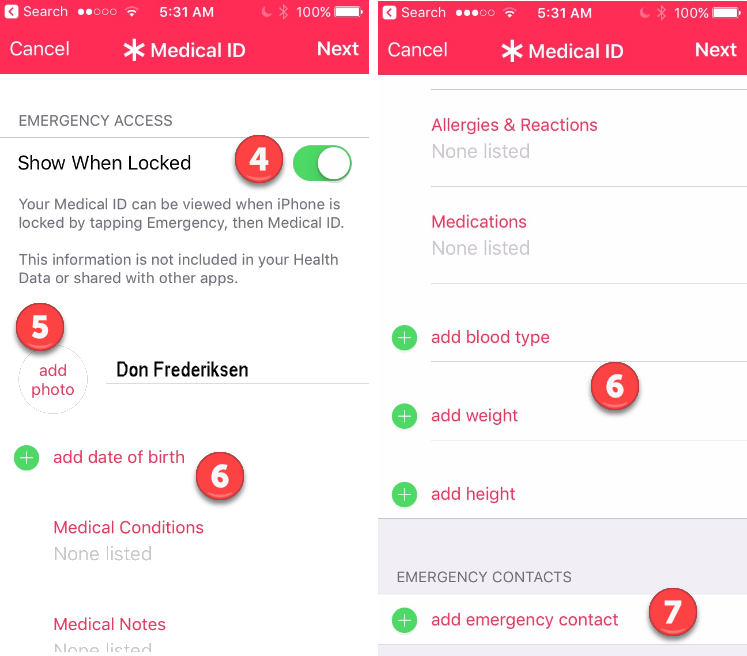 The Medical ID function of the iPhone’s Health App could be life saving. Medical ID is an emergency card that can store critical medical and contact information and be available to first responders even if your phone is locked. Tap Medical ID to review the current information. If you are creating a new Medical ID that didn’t exist previously, tap Create Medical ID from the information screen. If you wish to edit your existing Medical ID, scroll down your Medical ID information and tap Edit to update. You have a number of options in creating your Medical ID. You certainly will want to create Emergency Contacts and have critical medical information included. The list (4-7) below corresponds to the numbers on the screen shot below will provide the basic details to begin. 4. Confirm that Show When Locked is green/on. This will allow access to Medical ID information from the lock screen for medical/emergency responders. 5. Add a photo for identification. Tap add photo and you can choose from your photos collection or take a new selfie. 6. Tap individual entries to enter your your birth date, allergies, blood type and weight and height. All are optional. 7. An important element is entering Emergency Contacts. Tap add emergency contact. Pick one or more contacts from your contacts list and identify their relationship to you. You actually pick a contact by selecting the contact and completing the process by selecting the best phone number for the contact. There is also an opportunity for you to register with Donate Life America in order to communicate your organ donation wishes. 4 Confirm that Show When Locked is green/on. This will allow access to Medical ID information from the lock screen for medical/emergency responders. 5 Add a photo for identification. Tap add photo and you can choose from your photos collection or take a new selfie. 6 Tap individual entries to enter your your birth date, allergies, blood type and weight and height. All are optional. 7 An important element is entering Emergency Contacts. Tap add emergency contact. Pick one or more contacts from your contacts list and identify their relationship to you. You actually pick a contact by selecting the contact and completing the process by selecting the best phone number for the contact. There is also an opportunity for you to register with Donate Life America in order to communicate your organ donation wishes. 8 When you’re finished, tap Done. Here are the steps that a medical responder or ER personnel would use to access the Medical ID card. 2) Tap * Medical ID. iPhone 8 & later: Triple-click the side button. Tap Medical ID to display the information card. Calls can be made to your Emergency Contacts from the Medical ID screen without unlocking the phone. Tap the Phone icon to call. Senior Tech Club Recipe #118 – How to Use the iPhone Health App – It Could Save your Life! provides a more comprehensive look at the Health App with a Video demonstration.